Saving a little extra on your monthly power bill never sounds like a bad idea. While shutters do require a small investment in the beginning, they prove their worth as they continue to save their owners money while providing a classy, stylish appeal for years. Whether you’re decorating for efficiency or glam, you’ll find that shutters are the absolute best option for window fixtures of high quality and style. To give you a better idea of just how shutters can help you save a little on energy each month, we’ve provided the following benefits. Check it out then get started on installing shutters to increase energy efficiency and appeal in your home or business! They provide full insulation: Most window fixtures aren’t capable of fully insulating the areas around your windows and doors. 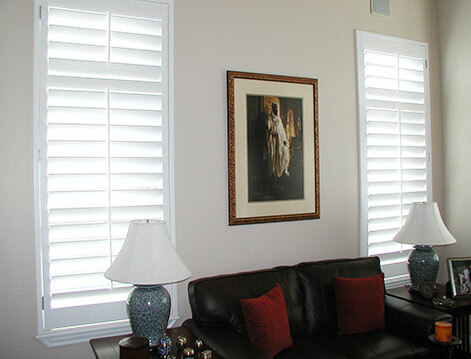 Shutters, however, provide unique coverage that wraps your entire window or door to keep out cool drafts and warm air. Wood shutters are especially great for insulation as their thick material absorbs the air before it can make its way into your home or business. They offer complete light control: Controlling where and how light can enter your structure can greatly affect the temperature. This is why optimal control with shutters is so great for keeping your home or business cool during warmer weather. The full coverage structure is able to completely block sun when closed and allow for controlled light when open. They don’t wear thin: The thick, quality materials used in shutters won’t break down and wear thin over time. This allows them to stay strong and keep drafts and air out for years to come. They’re also more resistant to damaging and coloring, making them a more cost efficient option as well. The Allow for air control: Keeping your home cool in the spring and summer can get tricky. If you leave a window open, too much sun can get in, but if no air can come through, you have to crank up the AC. Shutters allow you to open your windows with the shutters closed to enjoy a nice breeze while blocking the heat from the sun. They also protect your home from strong gusts of wind, allowing for a simple, cool breeze to pass through your home and replace the need for AC. Now that you know how you can decrease energy costs and increase appeal and efficiency in your home or business, it’s time to get started! For more information on the energy saving benefits of shutters or to get started on the design process, please visit our contact page.